Maggie Nichols, or ‘Mags’ as her friends call her, is from Little Canada, Minn., near Saint Paul, where she trains at the Twin City Twisters gym. She became hooked on gymnastics when her mom put her in a preschool tumbling class at age three. Nichols parents, Gina and John, have always been supportive of her gymnastics. She typically trains after school each day for four-and-a-half hours and keeps up with her studies on the bus while traveling to and from meets. A seventh grader at Parkview School, Nichols, 13, considers beam her favorite event and she’s hoping to make it to Nationals. Maggie considers meeting new people one of the best parts of gymnastics competitions. She also plays softball, and she enjoys spending time with her friends and her dog. Her brother, also an athlete, plays basketball. Nichols’ top three performances have been at the IGI Meet, the Sand Dollar Meet and last year’s Nationals. 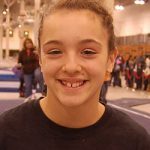 In 2011, she placed third in the all-around in the IGI Chicago Style Meet, as well as eighth on the uneven bars and ninth on the balance beam.